Boxing odds are moneyline odds. Unlike a sport like football which has a spread (Ex. Patriots -7), boxing has moneylines which I’ll explain with an example. In this fight, Floyd Mayweather Jr is the favorite at -260. This means that for every $2.60 you bet on Floyd, you would win $1 (assuming he wins the fight). So if you bet $260 on Floyd and he wins the fight, you win $100 profit. Since Floyd is the favorite, this means that Ricky Hatton is the underdog. For every $1 you bet on Ricky Hatton, you will win $2 if he wins. So if you bet $100 on Hatton and he wins, you’ll win $200. If you bet $100 and he loses, then you’re out $100. Moneyline fighter vs. fighter bets – This is the main bet that we described above. Draw bet – On most fights, you can bet if you think the fight will end in a draw. Over/under round betting – This type of bet means that you will be betting whether the fight will go over or under the amount of rounds stated by the sportsbook. The rounds are usually set at 10-11. KO or stoppage bet – A KO or stoppage bet means you are betting a particular fighter to stop the fight via knockout or stoppage. These bets usually have good value for a bettor. Where to bet on boxing? 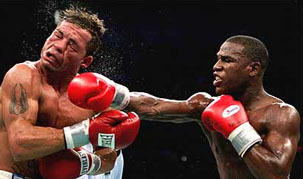 There’s a few quality sportsbooks that offer betting for boxing matches. All of these sportsbooks are very secure and have great customer service. Sportsinteraction.com – Sports Interaction is our number one sportsbook for MMA betting as well as boxing betting. They only accept Canadian bettors and truly focus on that market. Sports Interaction has odds posted early for every boxing fight and they also have over/under bets, KO bets and prop bets for major fights.